Smart clothing or „I-Wear“ is the connection of sensors and everyday clothing. Passive and addictive components can be combined on one hand, on the other hand data can be collected and send to the user. Such formal clothing can be useful in two ways. Firstly as a medical device and secondly as a lifestyle object to simplify one’s own daily life. Smart clothing or „I-Wear“ is the connection of sensors and everyday clothing. On one hand passive and addictive components can be combined, on the other hand data can be collected and send to the user. Such formal clothing can be useful in two ways. Firstly as a medical device and secondly as a lifestyle object to simplify one’s own daily life. The most common clothing covers the entire body and makes it possible to integrate technology in each garment. In this way, a motion tracking of the entire body is possible to analyze motion sequences and misalignments. 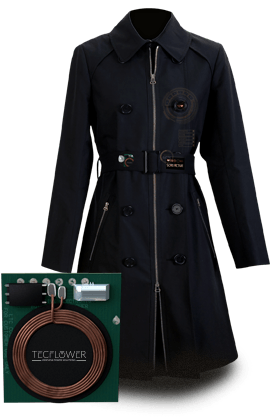 Every possible technology of smart devices can be integrated and combined in smart clothing. People are unobtrusively a part of the digital world. Based on this possibilities the charging of smart clothes should be as easy as wearing them. It seems quite strange to walk around with tons of cables. The perfect solution would be to hang the clothes in a closet, where they can recharge without any disturbing cables. TECFLOWER created such a perfect technology, that you can wash your smart clothes without any concerns. Start with us into a future of connected people. TECFLOWER advices you and shows you different solutions, which can be integrated into smart clothes. We are pleased to hear from you.